Information security is always of paramount importance, whether data is stored on-premises or in the cloud. Since the early days of AWS, we’ve done our best to provide our customers with the information, services, and features that they need to have in order to make informed decisions about what kinds of applications and what kinds of data they can and should store in the cloud. I think we can all agree that encryption is one of the principal elements of any data protection strategy. To date we have provided our customers with multiple options including client-side and server-side encryption for Amazon Simple Storage Service (S3), along with server-side encryption for Amazon Elastic Block Store (EBS), Amazon Redshift, Amazon RDS for Oracle, and Amazon RDS for SQL Server. Up until now, the server-side encryption support provided by these services has made use of “master keys” that are generated, stored, and managed within AWS. Today we are adding a powerful new option for key management, one that can manage keys for applications and services running in the cloud as well as on-premises! 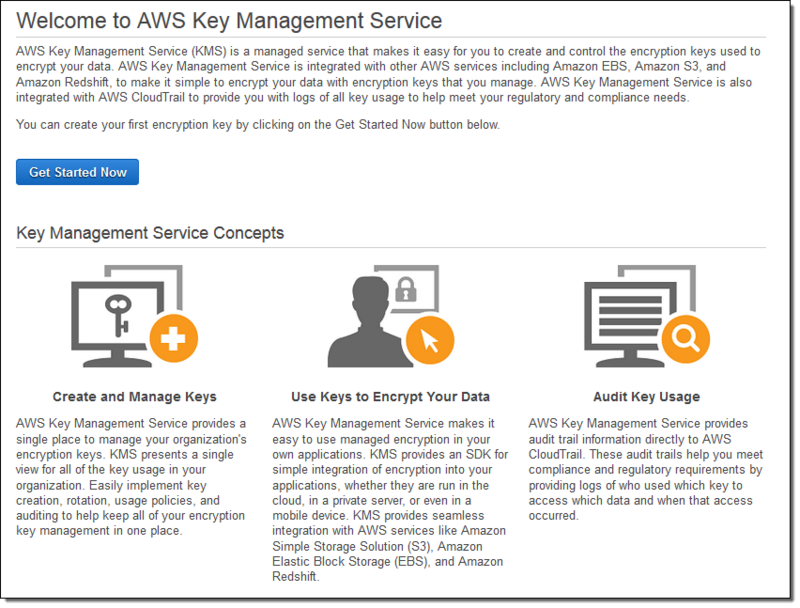 The new fully-managed AWS Key Management Service (KMS) provides you with seamless, centralized control over your encryption keys. It gives you a new option for data protection and relieves you of many of the more onerous scalability and availability issues that inevitably surface when you implement key management at enterprise scale. When properly used, AWS Key Management Service can even help to address lingering concerns about moving sensitive data to the cloud. The service is built on systems that protect your keys with extensive hardening techniques such as never storing keys on disk, not persisting them in memory, and limiting which systems can connect to the device. All access to update software on the service is controlled by a multi-level approval process that is audited and reviewed by an independent group within Amazon. All physical access for maintenance is tightly controlled (multiple, senior-level employees must cooperate) and logged. 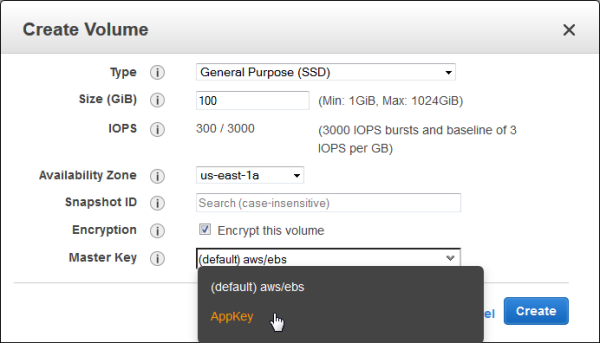 S3, EBS, and Redshift can now encrypt data at rest using keys controlled by AWS Key Management Service. 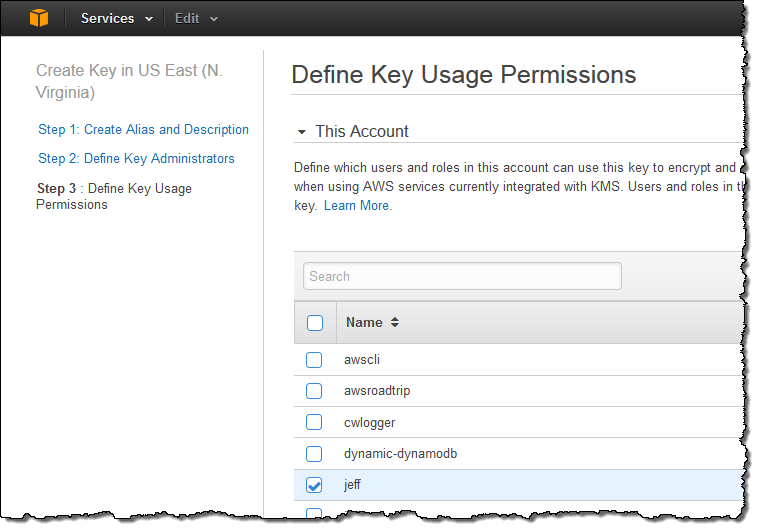 You can choose to use the default (master) keys for each service or you can use AWS Key Management Service to create and manage your own keys. You can define keys for each service, application type, or data classification. The service lets you define which master keys protect your data however you choose to organize it. 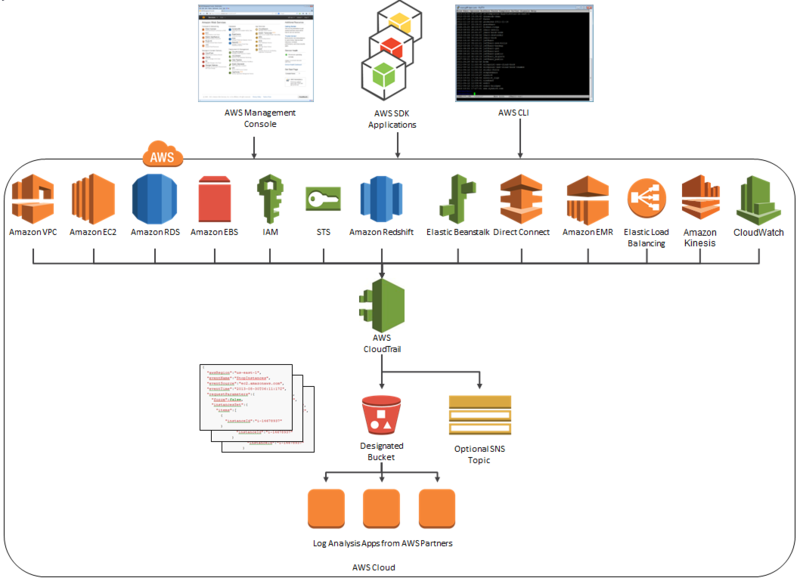 Regardless of the operation that you choose, all of the routine operations on keys (create, rotate, enable, and disable) are accessible from the AWS Management Console and through a set of key management APIs. 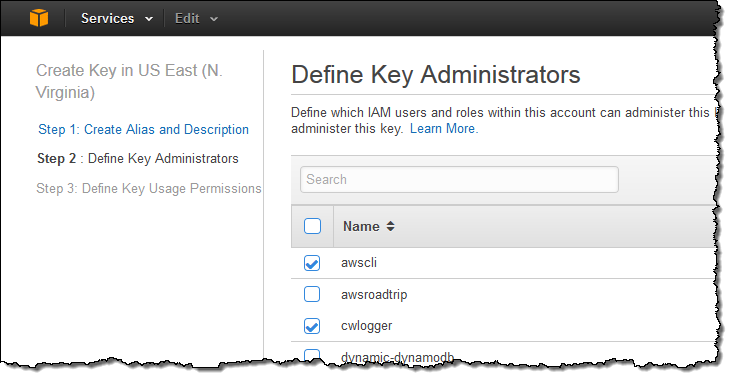 All operations on keys are logged to AWS CloudTrail. You can use the logs to find out how and when specific keys were used, and which services used them. In addition to managing keys for AWS services, AWS Key Management Service (KMS) streamlines the process of adding robust, fully-integrated encryption to your AWS and on-premises applications by supplying a rich set of key management and encryption APIs. All API requests against a key are logged to AWS CloudTrail so that you can track and understand how, when, and by whom the keys where used. All of the functions that I described above can also be accessed programmatically. 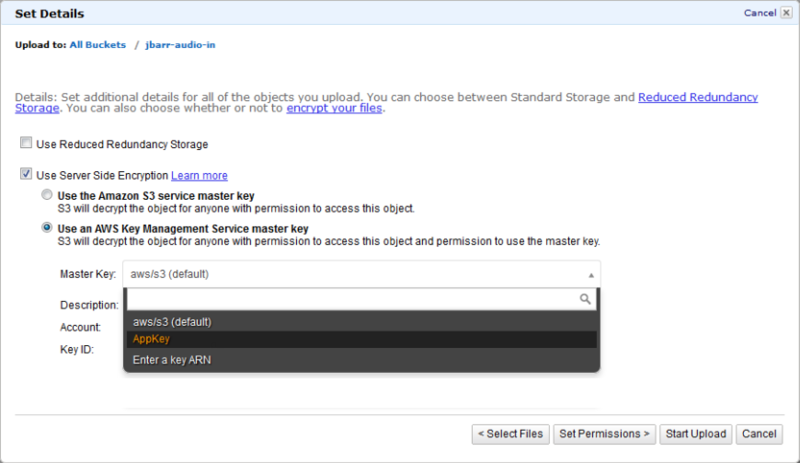 You can create, enable, and disable keys. You can use them to encrypt and decrypt your own data and you can enable and disable rotation. 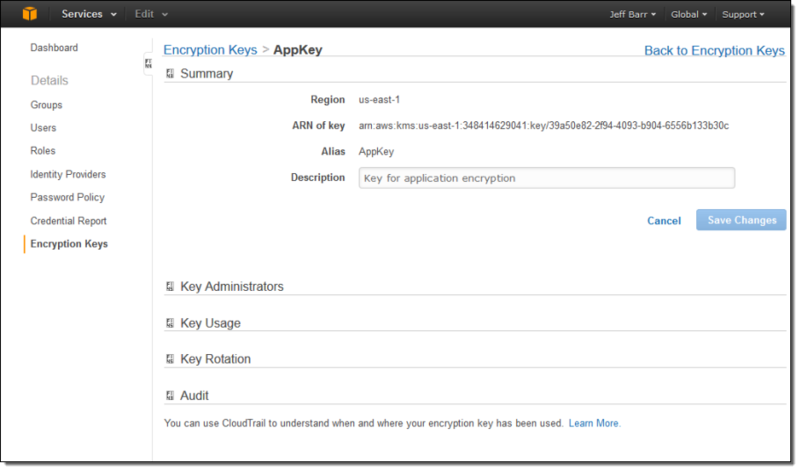 Your AWS and on-premises applications can use these APIs for key management and encryption. 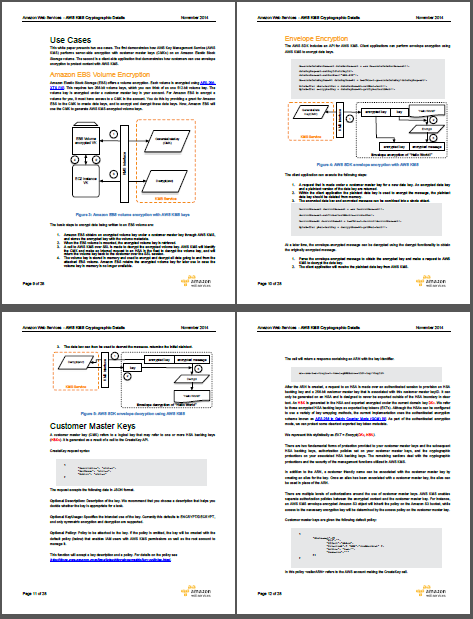 If you would like to learn more about the cryptographic operations that are executed within AWS when you use KMS, download and read our new white paper, AWS KMS – Cryptographic Details. This new service is available now in all public AWS Regions and you can start using it later today (visit the AWS Key Management Service (KMS) page to get started). You can create, use, and manage keys at $1 per key version per month. API requests to the service cost $0.03 per 10,000 requests. There is a free tier of 20,000 requests per month. Our customers use the log files generated CloudTrail in many different ways. Popular use cases include operational troubleshooting, analysis of security incidents, and archival for compliance purposes. If you need to meet the requirements posed by ISO 27001, PCI DSS, or FedRAMP, be sure to read our new white paper, Security at Scale: Logging in AWS, to learn more. Over the course of the last month or so, we have expanded CloudTrail with support for additional AWS services. I would also like to tell you about the work that AWS partner CloudCheckr has done to support CloudTrail. 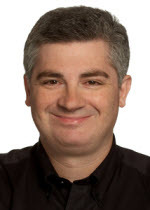 Elastic Load Balancing – New! CloudCheckr (an AWS Partner) integrates with CloudTrail to provide visibility and actionable information for your AWS resources. You can use CloudCheckr to analyze, search, and understand changes to AWS resources and the API activity recorded by CloudTrail. As you can see, the administrator can use the report to identify all the IP addresses that are being used to access the AWS account. If any of the IP addresses were not on the list, the administrator could dig in further to determine the IAM user name being used, the calls being made, and so forth. CloudCheckr is available in Freemium and Pro versions. You can try CloudCheckr Pro for 14 days at no charge. At the end of the evaluation period you can upgrade to the Pro version or stay with CloudCheckr Freemium.